Mary Beth, proprietor with husband Fred of the wonderful Cedar House Inn & Yurts in Dahlonega, Georgia, had this soul-satisfying chai waiting for us on the evening of January 1, 2016. 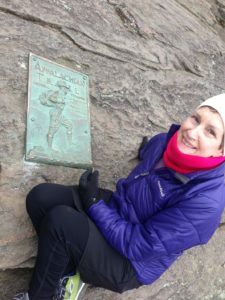 We left home early on New Year’s Day and when we finished our two chilly miles on the Appalachian Trail from the Springer Mountain parking lot to the summit and back, glamping at Cedar House sounded (and was) great. Put water, cardamom, ginger, cloves, peppercorns, ground pepper, and cinnamon sticks in a large saucepan and bring to a boil. Reduce heat and simmer 5-10 minutes. Remove from heat and add tea bags. Cover pot and let steep for 5-10 minutes. Strain out into coffee pot or pitcher. Add sugar and milk to taste. Makes about 12 cups.